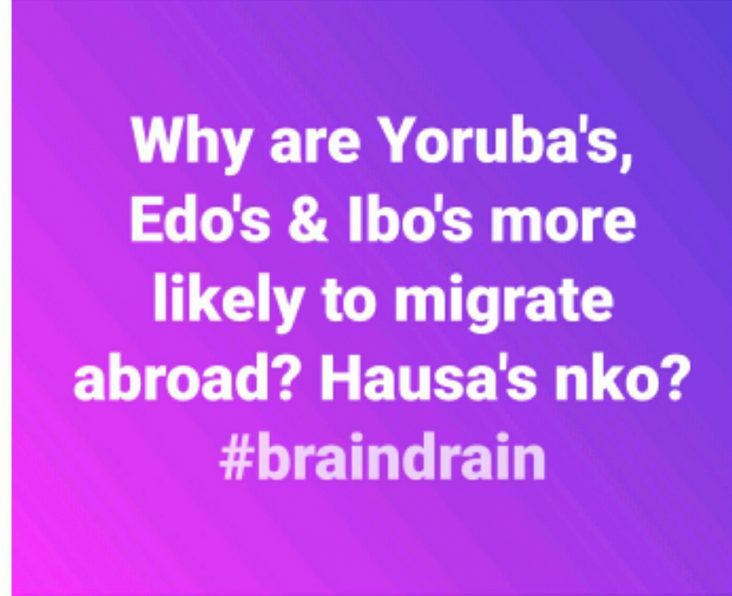 As a physiotherapist whose profession in Nigeria has been severely impacted by brain drain, watching the news about the xenophobic crime in South Africa made me curious why certain tribes in Nigeria apparently favour migration more than others. 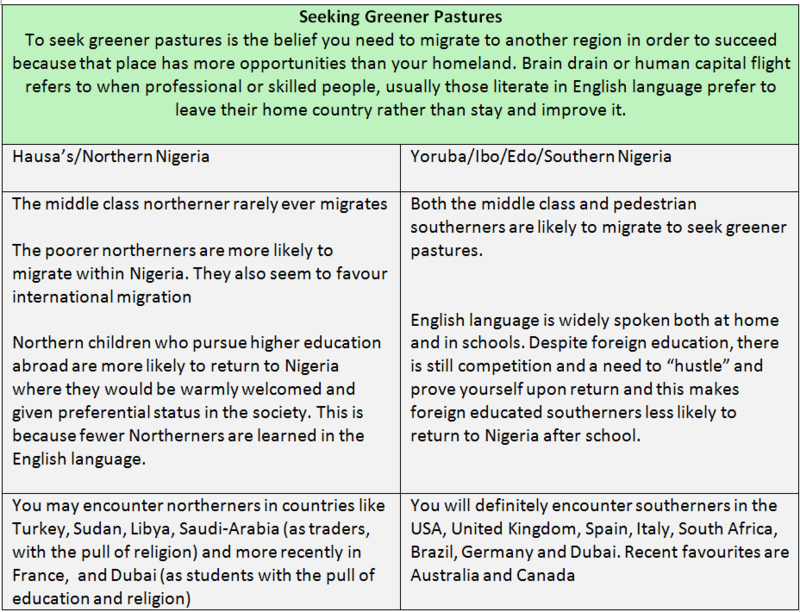 It is usually viewed purely from a socio-economic perspective but if northern Nigeria is relatively poorer than other regions, why are they less likely to migrate out of the country in search of “greener pastures” Why are the southerners-despite being relatively economically advantaged more likely to seek greener pastures? Why are southerners more open to the idea of migration and northerners appear more resistant? Why are southerners more likely to seek higher education abroad and remain there while the few northerners who go abroad are more likely to return home? Answer: A northerner’s sense of identity is more deeply rooted and enduring than the southerners. But let’s probe a little deeper. If both the north and south are both part of the country Nigeria, what made the southerners more susceptible? Are there other factors which shape the notion of identity? But why?! (mouth ajar, Yoruba style) if both regions had a writing system why did/are the southerners giving up their own? In case you missed the point despite efforts to put it in tabular form and reduce text… the northerners are less likely to migrate because they have a deeply rooted sense of identity and culture which is interwoven with the predominant religion, Islam and the widely spoken language, Hausa. The history of this identity has been largely preserved through generations by the Arabic writing system and the topography of their land typically insulates them from incursions of foreigners, reinforcing their culture and Identity. The southerners on the other hand, because they reside in coastal regions are friendlier and more amenable to external influences, hearing stories about foreign lands, they are not averse to exploration. When the incursions of foreigners became too overwhelming, the division among tribes prevented them from joining forces against the foreigners primarily because they had forgotten their history and could not recollect what made them brothers. If as a southerner reading this makes you uncomfortable, it’s not so bad, look around your environment see what the “exposure” has brought you. But if you want to argue that the postulations are wrong, ask yourself, why despite the history of slave trade and reports of bias against your black skin you still dream of going to oyinbo land because things are too hard in your country? Heck, some may even argue that you are still slaves, mental slaves. And dear northerner, does it occur to you that your sense of identity is so innate and so deeply rooted that every other non-Islamic, non-Hausa Nigerian never really “belongs” an elephant in the room when issues of Nigerian unity is discussed. Also, if being sheltered and insulated was such a good thing, why is the north still the most underdeveloped region in Nigeria? I rest my case. These are my thoughts, what are yours? P.S: The video of the mathematics of Ifa was a real eye opener for me and the ease of the Nsibidi script gave me childlike joy.